Outwardly, it’s very rare that I look like I’m enjoying myself in a bike race. The mixture of effort, suffering and concentration doesn’t leave much room for smiling and chuckles and at times I suppose I look like a bulldog chewing a wasp. I don’t care though, it’s not as though I’m trying to be attractive or photogenic, I’m just trying to get things over and done with as quickly as possible without buggering everything up, getting beaten by loads of people or hurling myself into the ground (and then getting beaten by loads of people). 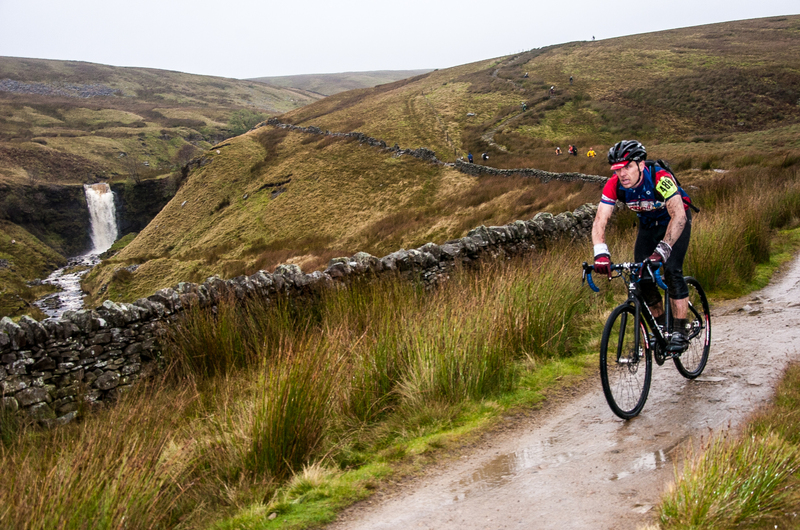 The howling winds, heavy rain, waterlogged con ditions and general grim-ness of the 50th3 Peaks Cyclocross brought out some of my finest-ever expressions of dark suffering. Of the five 3 Peaks races I’ve taken part in, this was by far the hardest and according to organiser John Rawnsley was the ‘worst conditions for 30 years’. It was pretty bad. 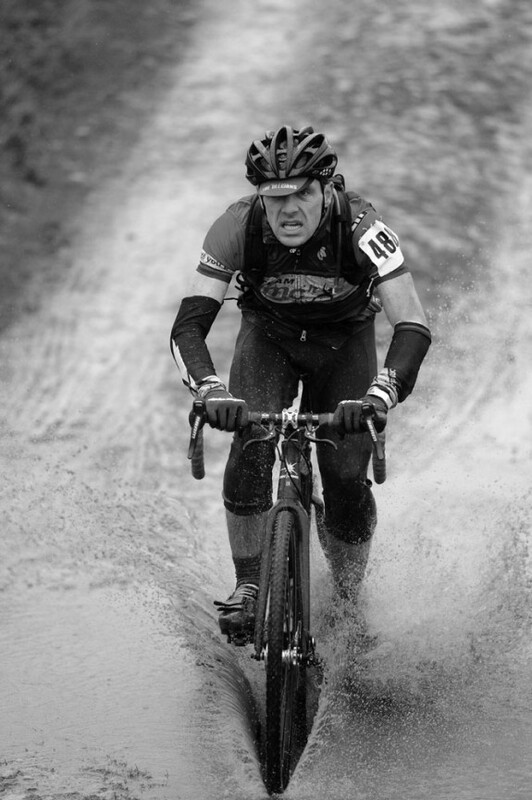 Despite appearances though, I loved each and every grimy, wet and painful second of it…. The day started with me being dropped off in nearby Austwick so that I could meander along the road to the start, get signed on and lined up while Deb headed off in the opposite direction in the car with my spare bike to wait at Cold Cotes, the end of the first peak, Ingleborough. My meander to the start became a bit of a mad sprint as the thirty minutes or so I had to ride two miles was eaten up by fiddling with my suddenly-problematic front mech at the side of the road. Drama behind me I said hellos and howdos to friends I only ever see at bike races and lined up. Plonking myself nearer to the front than I normally do (after some advice a few months ago from a wise man) I waited for the race to start. It wasn’t raining yet. I got ready for a good start. I had an atrocious start. My usual self-preservation instincts kicking in again I backed off to avoid a crash while others charged forward and lost about a hundred places in about 4 seconds. I spent the remainder of the ridiculously-fast ‘neutral start’ fighting my way back up the field, the amount of space I was enjoying was increasing bit by bit with every rider I overtook. I caught up with Phil, who’d managed to stay reasonably near the front, about a hundred metres from the first offroad section that effectively signals the start of the gruelling ascent of Simon Fell. It was wet. There was a massive lake in the middle of the farmers field that wasn’t there last year. The rider in front of me rode into what looked like a puddle, saw the water reach his saddle and promptly fell off. I don’t think he was too appreciative of my giggling. I felt sorry for the riders way back who would encounter worse conditions under wheel (and foot) than this once it’d been churned up. Once the muddy slog was over with, the climb up the fell began – just as insanely steep as I remembered it but with the added bonus of being wet and slippery too. My toe studs were digging into the wet hillside but I was worried about those ahead of me falling down onto my head. Ok, I always worry about that. But this time I was even more worried. Anyway, I was glad to reach the top. The top, where it’s really exposed and WINDY. The Wind! It was howling up there and for the first time the conditions went from ‘bloody hell’ to ‘God help us’. Pushing the bike along, remounting when possible, the line of riders reached the stile and carried on towards the summit. I noticed how quickly I was able to get over the stile as a direct result of getting closer to the front on the road and not having to queue…. This was utterly magnificent. After what seemed like a whole summer of drizzle, miserable skies and repeated races that turned into mud-fests, I felt like I was finally alive, willing the elements to do their worst. The descent of Ingleborough, as usual, was incident-free. Some comedy high-speed crashes had to be avoided but nothing too bad. Everyone was looking forward to the tailwind in store along the road to Whernside. That was a big one and a nice turbo-boost along the road….but it was assistance that everyone was enjoying so I made sure I was still putting out a proper effort and was glad I’d fitted a 50 tooth big ring. Then the cramp arrived. I think I might have been pushing a bigger gear than I should have on the Ingleborough plateau and one of my calves was rebelling. I downed half of my electrolye drink. It did nothing and the spasms kept coming. This was a bit early in a race for this kind of nonsense but I stretched it as best I could and gingerly rode to Whernside, every surge of power being rewarded with another muscular grumble. 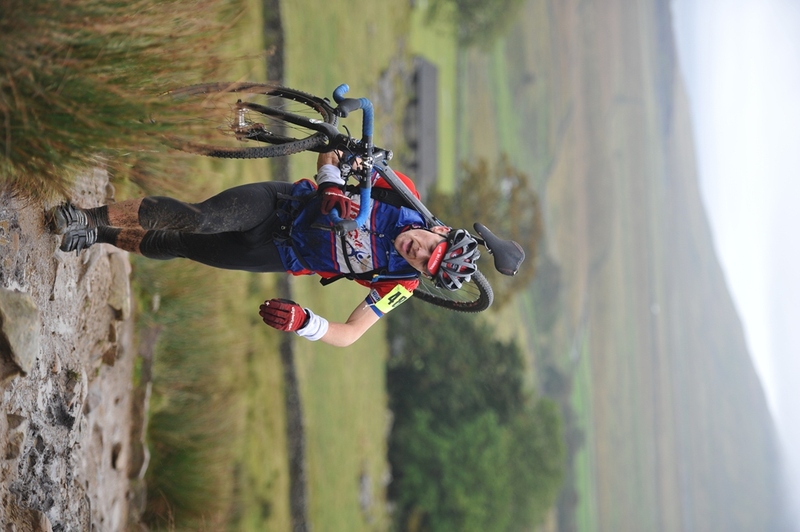 The climb of Whernside is my favourite part of the 3 Peaks and is the reason I was so keen to get closer to the sharp end of the race this time. Back where I normally find myself, the narrow stone steps are often crowded and in wet conditions the opportunities to overtake by going ‘off-piste’ are severely limited. This time though, the place seemed almost empty. With luxurious amount of room and the fact that I wasn’t cramping while on my feet, I trotted up the hill and took a few places in the process. It started to rain. I was exposed to the wind again, but it was mostly behind me and I was enjoying it again. Reached the summit in pretty good shape and started to ride down the other side…. No messing about dismounting, I rode the stone steps near the top as usual and was clearing the large drainage channels without any problem at all. until I crashed, that is. For some reason I was fazed by one of the larger gaps in the stonework and braked. I realised my mistake about one second later as I pulled myself out of the deep and water-filled bog, my knee smashing into the stone slab my front wheel had just slipped on. That was painful. Properly painful. I felt sick. I stopped for a minute or two, waiting for the pain to subside. It didn’t. I started to run down the steps but that just made the pain worse – my ‘trump card’ of being able to run well was, for the time being at least, in tatters. I remounted the bike and tried to put the crash behind me and rode down as much as I could. Thankfully, I made it to Ribblehead without losing too much time despite the excitement of the previous few minutes and also the comedy knee-deep raging torrent of water (where once there was a little water splash). More cheering crowds, including Debbie waiting with the spare bike in case I needed it. Back on the road. The return of the cramp. Into a headwind now and starting to feel pretty bashed up (because I was pretty bashed up). My knee was still more painful than it should have been for a crash that happened twenty minutes ago but I got my head down, chucked my Clif Double Shot gel down my neck (never leave home without a Turbo gel, folks) and battled the wind. The comedy soon returned as the ‘puddle’ near the start of the offroad climb of Pen Y Ghent submerged all those who rode through it. It was ages before I saw the race leaders pass me on their way from the summit to the finish so I assumed that meant I was doing ok and chipped away at the hill. The final few hundred metres to the checkpoint at the summit was ridiculously windy. I stretched out my arm with the electronic chip around my wrist and finally started my final ascent. The ordeal not quite over. The first part of the PYG descent involved riding with the company of a pretty powerful cross-wind so I grimaced and ran quite a lot until I reached the paved, but still steep, lower part of the hill. My brake pads were pretty worn by now but the bike was, as it had been all day, eating downhills for breakfast. I tailed another rider all the way down, he was really shifting and was happy to shout at spectators and walkers on the path all the way down to buy himself room – he upset a few people I think but it was getting us down and to the road in double-quick time. We worked together on the road to the finish as he was pretty exhausted and my cramp had now spread to my left thigh. This had to end and end right now…. Thankfully it did. My finish time of 4 hours and 3 minutes was exactly the same time I achieved last year (when it was much nicer weather) and I crossed the line in 54thplace. Grinning. In pain. I’d been through the mill, in fact I felt like I’d punched a hole in it and rode out of the other side. There’s no other race that I’ll ever do where I’d be happy with 54th, but the 3 Peaks is different. In fact, the improvement over last year’s race has got me thinking…what if I actually, properly trained for the 3 Peaks? Next year, I’ll be praying for rain and high winds….